1. Heat the oil in a large frying pan and fry the chicken and leeks for 5 minutes until the chicken is cooked through with no pink meat. Add the cheese sauce and cook for a further 3-4 minutes, then stir in half the chives. Transfer to a heatproof serving dish and sprinkle over the cheese. 2. 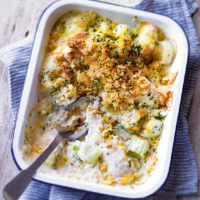 Lightly crush the crisps in their packets then mix with the breadcrumbs and remaining chives and sprinkle over the chicken and leeks. Place under a preheated grill for 1 minute until golden and crisp.